Being connected with other small businesses in The Chook House has really paid off for Gretchen Bunny and the team from Agrecord recently. With minimal employees the business is a lean-mean machine, with Gretchen managing many of the key business functions herself – including sales, customer service, finance, HR and marketing. In an neighbouring office in The Chook House, Alex Walker is researching, creating and implementing marketing plans so when an opportunity arose to profile some rural businesses on the NZ Herald Business pages, Alex was quick to pick up the phone and call Gretchen. In a series published in their Business pages, the NZ Herald was looking for comment and experience about the challenges of doing business from rural areas. 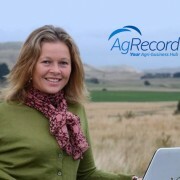 Gretchen stepped up to the plate and shared her story about Agrecord – an ironic one as running a cloud-based business from a farm which, at one time, had no viable broadband connection is a pretty big leap! Gretchen was also quick to share about her time in The Chook House – meeting new people, making new connections, and using high speed affordable broad band! The result of this story was wide-reaching coverage for Gretchen and Agrecord, and stimulated product enquiries from as far afield as Te Anau. As the whole exercise was free for Agrecord and The Chook House that equals very cost-effective marketing! You can read the whole story about Gretchen and Agrecord here.